F&V announces EverTrue Vari-Color lighting fixtures with true, tintless white light at all correlated color temperatures throughout the adjustment range. 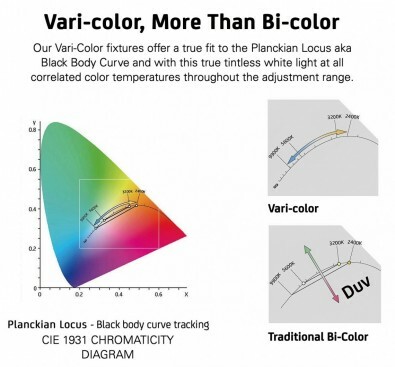 F&V said EverTrue Vari-Color 3x1 fixture offers a perfect fit to the Planckian locus (aka black body focus). The Planckian locus is the path that the color of an incandescent black body would take in a particular chromaticity space as the blackbody temperature changes. It goes from deep red at low temperatures through orange, yellowish white, white and finally bluish white at very high temperatures. Accurate color reproduction is the basis of F&V’s new EverTrue fixtures, providing a well balanced, full spectrum light for maximum color accuracy, with a TLCI up to 99. Factory calibration ensures consistency from the beginning with virtually no tolerance from fixture to fixture. To ensure consistency after years of use EverTrue fixtures can be recalibrated by the user for accurate colors and color temperatures. In the white-light mode, the Z1200VC CTD-Soft fixture offers maximum color reproduction from 2800K to 6500K. For more extreme color temperatures, the extended Kelvin Mode offers an even wider CCT range from 2400 to 9900 Kelvin. The Z1200VC CTD-Soft fixtures can adapt to the tint of other lights on the set easily with a built-in tint control to adjust ± green/magenta. The fixture has a large aperture providing soft brightness from a huge fixed diffusor panel. At the same time, it’s light in weight, thin and compact to fit into tight locations. Using 270 watts, the Z1200VC CTD-Soft is a powerful light. Because of its sophisticated passive cooling system, it’s also completely silent. Extraordinary brightness throughout the color temperature range is a key strength. With a beam angle of 130-degrees, it can create brightness with an even, homogeneous and soft quality of light. As an all-onboard solution, the controller and powering solution can be attached to the back of the light head. For optimal weight distribution, the controller and powering solution can be attached together and used remotely from the lightweight light head. With built-in DMX 512 and Wi-Fi, users can control the Z1200VC CTD-Soft in any situation. With a built-in digital filter library of more than 300 popular color and correction filters, lights can have gels without light loss or having to carry filters. The light weighs 10.1 pounds and is priced beginning at 1940.00 U.S. dollars. In addition, F&V offers other lighting models, including the Power series, the Soft series, the SE series and the UltraColor Series. F&V is located in the Netherlands.